Earlier this month, The A Group moved into a brand new space in Brentwood, Tennessee. Nearly twice as large as our old space, our new office accommodates our growing team and capabilities. 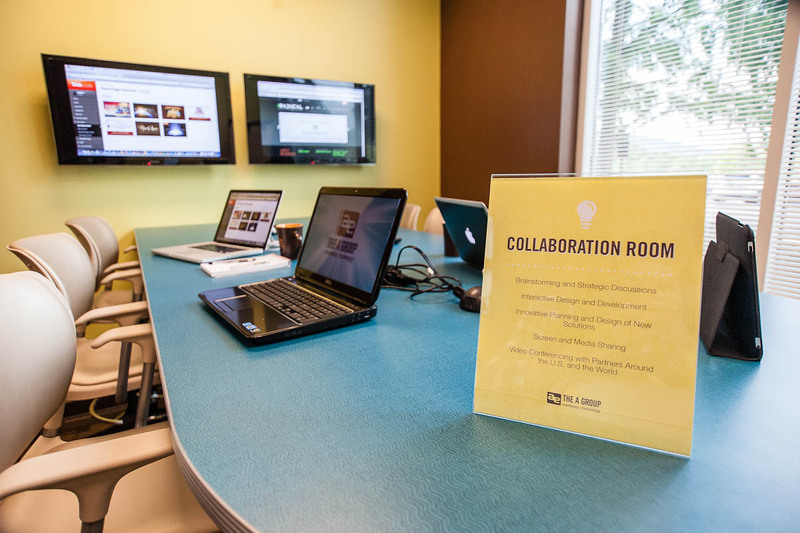 Our collaboration room allows for screen sharing between multiple computers, making for easy strategic planning between design and development teams, as well as video conferencing with our global partners. We've also added an in-house video studio, more common areas for collaboration between teams and the ever-popular 70" touch screen television in our conference room.Â With artwork we've created for clients throughout the years proudly displayed on the walls, there truly is a piece of ourselves and our partners in everything we do. With more than 10 years of helping ministries, churches, nonprofits and Christian resource organizations tell their stories through marketing and technology, this move marks the next chapter in our growth, and we look forward to the future. We are excited to continue to serve you and hope you have the chance to stop by and see our new space!